Where are you guys ? There are a lot of people who find God through education & Science so !! I will continue on Saturday .... promise ( Don't have much time today) . Correct. Nor does the Theory of Evolution deny the existence Quetzalcoatl, leprechauns or faster-than-light travel. Evolution should have been thrown out as a viable theory over 50 years ago. It turns out the "simple" cell isn't simple at all consisting of thousands of symbiotic interdependent relationships characterized by irreducible complexity which is what we observe. It takes less faith to believe that there was a designer and he created it all in 6 literal days. 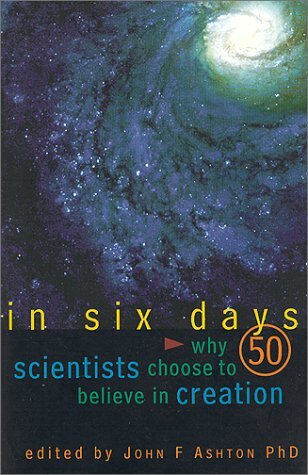 Anyone interested in actually learning about this not simply participating in circular debates read the following book. I also recommend checking out Dr. Chuck Missler's commentary on the Genesis creation account. It's easily found on youtube. The evolution religion is just that. It's a well propagated religion that is well funded by humanists agnostics in high places of government and education. It looks to be their desperate attempt to escape accountability for what they do in this life to a creator so they can justify themselves proclaiming themselves to be wise. God holds us all accountable due to simply the creation. The creation implies a creator, and our #1 priority in life should be to find out who this is and what is expected of us. Just as neither this computer or a car can build themselves by the parts inside them, neither could this universe. Anything engineered requires an engineer. This is all logical thinking. We are all held accountable by the creation itself. All evidence points to a designer. The Genesis account fits in perfectly with what we observe in science. Evolution is built on faulty assumptions that contradict what we observe. The imagination takes over and someone pays to keep the faulty assumptions going. Dating methods are highly based on assumptions of various kinds. So thus millions have been indoctrinated into this religion that is hindering scientific advancement and destroying lives across the globe. Science is good and helps us understand our existence. Faulty interpretations of science propagandizing it as infallible fact shutting down the opposing viewpoint isn't. There are plenty of scientists that have lost their positions at universities for holding a creation view going against the mainstream evolution religious establishment funding this. Last edited by Mikelee81; 10-13-2011 at 10:01 AM..
Flat I tell you! The world is flat! It turns out the "simple" cell isn't simple at all consisting of thousands of symbiotic interdependent relationships characterized by irreducible complexity which is what we observe. Give a precise definition of this term. So who are the 50 scientists in question and what are their qualifications? Any biologist? The evolution religion is just that. It's a well propagated religion that is well funded by humanists agnostics in high places of government and education. Also, are you aware that many scientists in biology, cosmology and related fields are believers? How do you explain this? Anything engineered requires an engineer. By definition. But you haven't established that the universe is a creation, or something engineered. You're just playing a word game here. It's called a circular debate. No need to chase the evolution evangelists in circles on the forums here. Natural selection = Selects from an already existing gene pool not evolving into new one. We could talk about the origin of elements past Iron. The rotating of moons in opposite directions (defies angular momentum in "Big Bang" accident. The laws of thermodynamics. The faulty assumptions in dating methods. Evidence for a flood. Evidence of Dinosaurs living with Humans. The info is there for anyone to look. This could really go on for quite a while. People looking for a debate generally are interested in debate not truth. look for truth not debate. Winning a debate means nothing. Winning the truth means everything. I'm pretty sure you don't understand what evolution is, and that's why you fight so hard to disprove it, using evidence that is unrelated to it. Looks like someone has swallowed the Argument From Ignorance, dressed up by Behe in a scientific guise, hook-line-and-sinker. "I just can't believe that bacterial flagellum could have evolved (actually, I'm a scientific illiterate, but it just sounds so good the way that smart scientist guy writes in and I really, really, really want to believe him! ), therefore the deity described by my favorite dirt-ignorant band of ancient desert-dwellers must be true!"